Mazco manufactured valve changers work on valves with oblong port plug valves (Mueller, AY McDonald, Dresser, Rockford Eclipse, and other manufacturers) used on service risers and meter valves. These units are available in sizes from .300" to 2". All valve changers are Professional Engineer certified. These valve changers work on valves for service risers, meter valves and other main line isolation devices. This technology allows for valve changes up to 100 PSI in a gas-free environment. 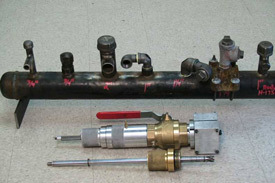 Changing valves can be done in a few minutes and does not require eliminating flow from the source. Manufactured valve changers are customizable to irregular port configuration and sizes and are customizable to virtually any length or diameter. For more information on this device, contact your nearest distributor or Mazco directly.